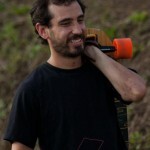 Although the champion was already decided, all of the Brazilian top players made it to this last World Cup of the year, among 73 other riders. Paixāo, passion in portuguese, honored his name by overtly excelling two years in a row, we might be in the midst of a long reign of Guto Negão, who even in tracks that don't favor him can beat the others. This passion can only show us how to face the coming year in which we will once again elect our board of directors and must strive to keep our sport and association alive. William Rubim, Pepe Laporte and Thiago Mohr fought galantly their way to the final in a series of very exciting heats characterized by lots of overtakes, falls and slides. Sirley Tabares from Colombia surprised the Women category by smartly taking advantage of an early fall in the final and holding on to the first place up to the finish line, grasping the desired crown. Sabrina Ambrosi from Argentina came in second, and Brazilians Melissa Brogni and Luana Campos third and fourth. Juniors was won by Pastrana, who also won the consi final in Open. This young breed of strong pushers and fast tuckers will surely be something to look for in 2017. Masters class was won by Silon Garcia and in second place OG Nikima, they showed how even masters can truly handle this new style tracks. Luge was won by Leo Borton on a street luge among 4 of his peers. The podium ceremony was held in Aguas de Lindoa's beautiful central park, where not only the winners of this event were awarded, but Koma Kino, IDF President presented the World Cup 2016 all Brazilian podium. 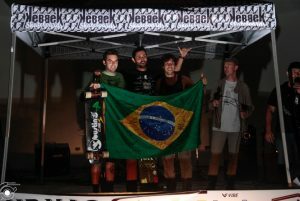 Max Ballesteros in third place, Thiago Gomes Lessa in second and second time winner Carlos Paixāo. Brazil has a very well structured support plan for riders, the "Bolsa de Atleta" (Athlete's Purse) that gives top positioned athletes in any federated international sport a yearly prize, a reason to make them so competitive and dedicated. We would like to specially thank Mathues Felicio and Pepe Laporte for going out of their way to help us do our work here. I have skated all my life, started racing in 2009 and started organizing events at the same time. I love bringing the opportunity for riders to transgress their limits in a safe environment.